The fast-casual food segment may be small, but its growth is outpacing the restaurant industry, attracting new competitors and spurring evolutionary changes from quick-service and full-service brands. Fast-casual sales were about $31 billion in 2012, up 13 percent from the prior year. That’s a huge increase from 2005, when segment sales were about $12 billion. Fast casual makes up about 7 percent of the $435 billion restaurant industry, but that share will continue to grow. Technomic forecasts a 3 percent nominal increase in restaurant industry sales in 2013 over the prior year but expects fast-casual segment sales to rise by about 10 percent. Fast casual is generally defined as establishments with a limited-service or self-service format, check averages above $9, food prepared to order, fresh (or perceived as fresh) ingredients, innovative food suited to sophisticated tastes, and upscale interior design. Fast-casual concepts tend to attract more lunch than dinner business, but several chains are courting evening guests with enhanced service, comfortable dining rooms, and adult-beverage menus. Growing fast-casual brands target the same locations that other restaurants — especially quick-service concepts — do. However, fast-casual concepts generally don’t have a drive-thru, so their units — averaging 2,000 to 4,000 square feet, depending on the brand, location, and other factors — are also suitable for strip centers and city centers. At the same time, their focused menus don’t require the large kitchens that full-service operators need. Because most of their business occurs at lunch and their customers tend to have higher household incomes, fast-casual chains target areas with both midday traffic and residents with incomes greater than $50,000. But their appeal enables them to thrive in cities, suburbs, and small towns. The segment has much going for it in today’s economic and social climate. Fast-casual restaurants give casual-dining consumers an opportunity to trade down to lower-priced yet high-quality fresh food. At the same time, they allow quick-service customers to trade up to a “third place” environment that offers affordable food quickly at a cost that is usually only a few dollars more than typical fast food. Fast-casual consumers tend to be from higher-income groups, and those making higher incomes have been affected less by the recession and slow economic recovery. The segment also attracts younger customers. However, as the segment continues to grow, its customer base becomes more mainstream. The fast-casual segment has origins in what used to be called “home meal replacement” and “adult fast food.” Chains such as Fuddruckers, Au Bon Pain, and Taco Cabana featured food, atmosphere, and prices that were a step above quick service, in an effort to offer casual-dining quality in a limited-service setting. In the 1990s, fast-casual concepts such as Boston Market, la Madeleine Country French Café, and Einstein Bros. Bagels raised the bar on convenience and efficiency, which made them even more competitive with quick service. Throughout the segment’s evolution, some concepts have adapted to remain relevant, and others have not. Today, leading fast-casual chains have built on the strengths of their predecessors but have continued to stay ahead of consumer demands for comfortable and contemporary décor, fresh and better-for-you food, and social consciousness. Looking ahead, there are several areas where tomorrow’s leaders will differentiate themselves. Leading chains are capitalizing on their successful formulas to create new concepts. For example, Chipotle’s ShopHouse Southeast Asian Kitchen features the company’s proven format offering customization of high-quality ingredients, applied to Vietnamese, Malaysian, and Thai flavors served on rice, noodles and bahn mi. Fast-casual leaders are looking at ways to enhance varying points of service. On one hand, Panera and McAlister’s Deli are testing drive-thrus to up the convenience factor. At the other end of the spectrum, Wingstop has debuted a casual-dining concept, Wingstop Sports, with a sports-bar-and-grill atmosphere, plenty of HD TVs, and a full food and drinks menu. Some emerging concepts are taking the menu to the next level, aiming to offer fine-dining cuisine in a limited-service format. Tom & Eddie’s, a higher-end better-burger concept developed by two former McDonald’s executives, features menu items developed in collaboration with local college culinary programs. Its $13 average check is slightly higher than the average fast-casual restaurant’s. And several growing fast-casual concepts are looking for new ways to engage their media-savvy customers with LCD menu boards, HD flat-panel entertainment, complimentary Wi-Fi, social networking, and entertaining but useful mobile apps. A look at growing chains within fast casual finds both national leaders and emerging upstarts. Among the larger chains, Jimmy John’s Gourmet Sandwich Shop opened 231 units in 2012, for a total of 1,560, which was the largest increase in U.S. units for a fast-casual chain in 2012. Chipotle Mexican Grill and Panera Bread netted the next largest increases for the year, adding 174 and 163 units, respectively. In terms of ownership structure, among the top 150 fast casual chain restaurants, 47 percent of the units are company owned and 53 percent are franchised. Ninety-seven, or 65 percent, of the top 150 fast-casual brands have at least one franchised unit. The growing fast-casual chains reveal some menu-segment potential. Niches like bakery cafés, fresh Mexican, and so-called “better burgers” are already well represented by leading brands such as Panera, Chipotle, and Smashburger. However, the ongoing success of these brands, as well as the reasons that consumers like them, indicate that there still may be plenty of opportunity in those menu segments. 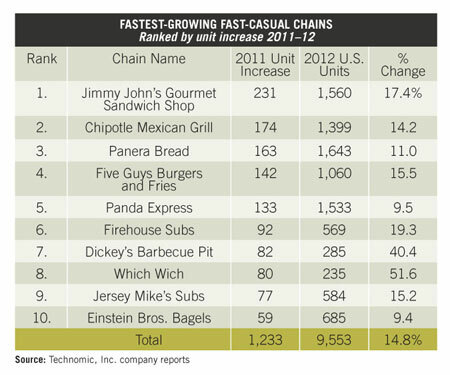 In the ranks of the fastest-growing fast-casual chains with less than $50 million in U.S. sales, three categories are represented most often: burgers (Bareburger, Umami Burger, Mooyah, Elevation Burger, and Jake’s Wayback Burgers), Mexican (Hot Head Burritos and Lime Fresh Mexican Grill) and healthy (Fresh Healthy Café, Muscle Maker Grill, and The Veggie Grill). Technomic is watching other segments that have significant growth potential and don’t currently have a leader with national coverage, in particular, Mediterranean, made-to-order pizza, barbecue, upscale chicken, and “green” fast-casual concepts. Technomic expects that fast-casual growth will continue to outpace industry growth, and that ongoing innovation and new development will come from both category leaders and upstarts. This entry was posted on Wednesday, November 20th, 2013 at 3:42 pm and is filed under Uncategorized. You can follow any responses to this entry through the RSS 2.0 feed. You can leave a response, or trackback from your own site.